When Scott and I went on our west coast vacation a year and a half ago, we went out with one of Scott’s friends from high school on our last night in San Francisco, and were all drinking Moscow Mules. I’d never heard of them, even thought they’ve been around for decades, but the traditional shiny copper mugs they’re served in were enough to win me over. 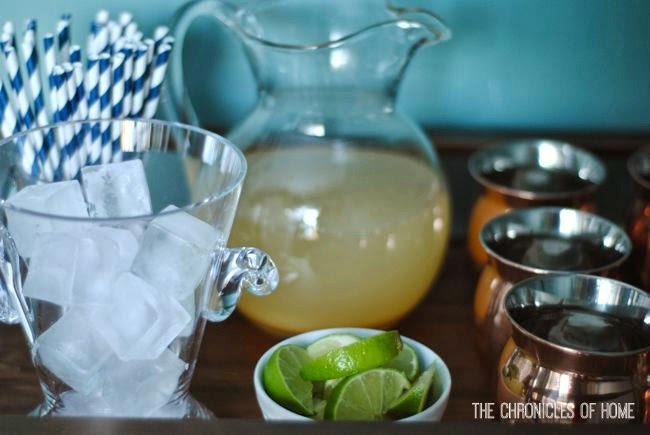 A Moscow Mule is usually made by mixing vodka, ginger beer, and lime juice. I was doing a little reading about them recently, and apparently they’re not too highly regarded among bartenders. In fact, one cocktail roundup I was reading dubbed the Moscow Mule one of the most overrated drinks around. I mixed up a batch a few weeks ago and they actually weren’t as awesome as I’d remembered. 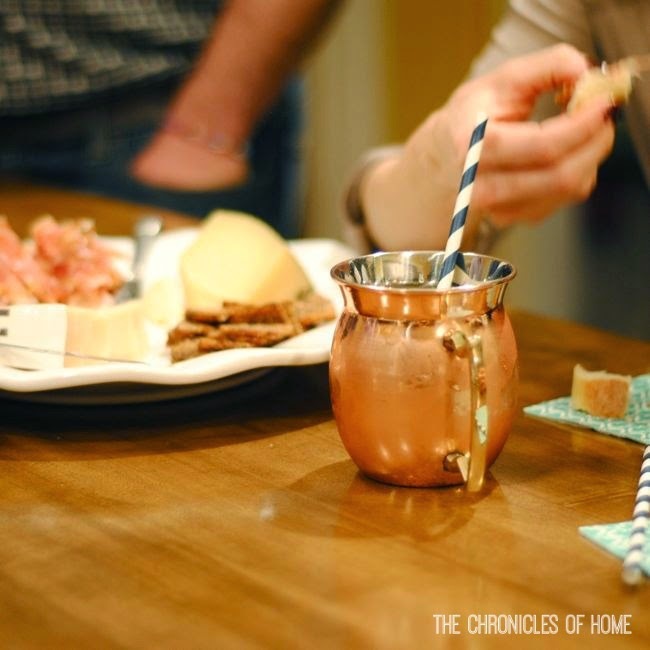 Two big things were lacking for me – the ice-cold copper mug and a really strong ginger flavor. I bought six of these copper mugs on Amazon, and then set to address issue #2 – ginger flavor. To get a more pronounced ginger flavor, I abandoned the ginger beer and made my own ginger simple syrup. I used both fresh and dried ginger and let the syrup sit in the fridge overnight so the spice and flavor of the ginger would really infuse the simple syrup. 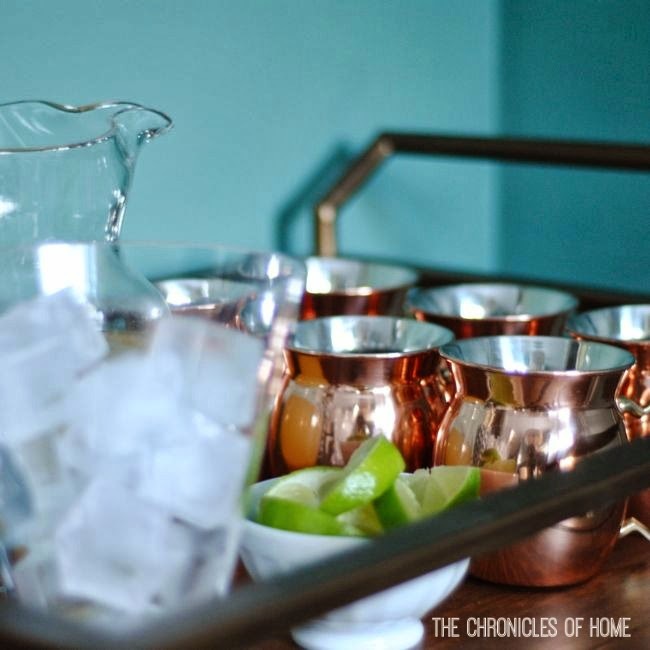 We hosted our first dinner party in the new house this weekend and I had so much fun setting up a little Moscow Mule station where we could mix the drinks together for our friends. I mixed the cocktails up ahead of time in a pitcher and set out ice, lime wedges, sparkling water, and striped straws for stirring or sipping, so it was really quick and easy to make the cocktails at the party. 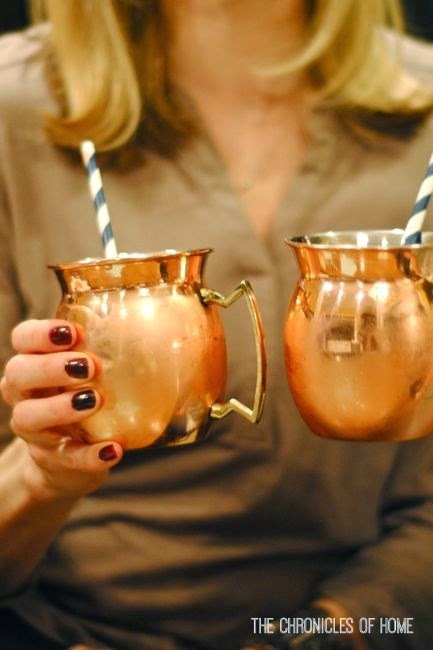 You can bet these gorgeous copper mugs will be getting lots of use for all kinds of drinks this spring and summer! Stir the ginger simple syrup, lime juice, and vodka together in a glass pitcher. Refrigerate until ready to use. To mix the drinks, fill a copper mug or other glass with with ice, then pour the mixed drink in to about 2/3 full. Top with club soda to taste and stir. Garnish with a lime wedge if desired. Combine all ingredients in a medium saucepan and cook over medium-high heat until the sugar is dissolved. Refrigerate overnight, at least. Strain fresh ginger before using.